Driving down to Tucson today to be present at the unveiling of the James Young gravestone dedication tomorrow, Martin Luther King Day. Historian John Langellier is the guy who gets the credit for this long overdue tribute to an unsung Arizona pioneer who was buried without a tombstone back in 1935. 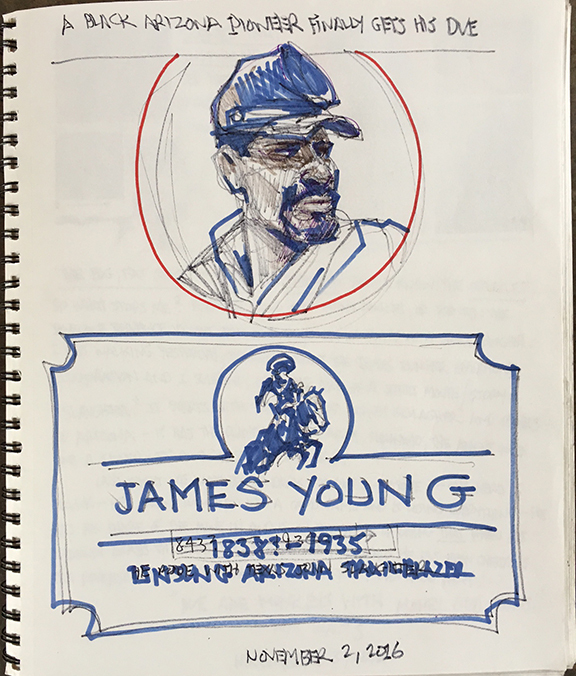 When John told me he had found Young's unmarked grave at Holy Hope Cemetery in Tucson I told him I would help design a simple headstone to honor him. I turned my rough design (below) over to Dan The Man Harshberger, who did his usual brilliant design treatment. Our goal was to design a headstone that Jim himself would perhaps want. I hope we have succeeded. Daily Whip Out: "James Young Headstone Sketches"
The gravestone dedication is open to the public and will come off tomorrow (January 16) at 10 in the morning at Holy Hope Cemetery in Tucson. Pictures tomorrow. Hans Olson produced the video for my induction into the Arizona Music And Entertainment Hall of Fame induction ceremony last November 13 in Tempe. The video—also narrated by the Blues legend—is now up on You Tube and available for viewing. I especially love the opening music, which, if I had my way, would play, loudly, when anyone walked past my own headstone. "Never did lose that twenty pounds." Was Jim Bowie Murdered? Or Did He Commit Suicide? Once Upon A Mama Mia In The West?